The Barossa Valley was initially settled by German speaking migrants from what was then Silesia in the early 19th century, who began the rich tapestry of the region’s mixed farming history. Many of the traditions of these early settlers are still celebrated by the Barossans of today, not least the food traditions of smoked meats, artisan breads, homemade pickles and preserves, and – of course – wine. Whether it’s a crisp Riesling, a fresh Chardonnay, a generous Grenache or a powerful Shiraz, the Barossa produces wines of the highest quality to suit every palate. Set amid a collection of historic townships that welcome visitors with our legendary hospitality, the Barossa Valley is now one of South Australia’s premier tourist destinations. There’s always plenty to do in the Barossa at any time of year. Start the day with an early morning hot air balloon ride to see the sun rise over our majestic valley. Perhaps 18 holes in the morning at Tanunda Pines Golf Club, while those less interested in improving their handicap explore the many shopping opportunities around the valley. Art lovers will enjoy The Jam Factory at nearby Seppeltsfield. To truly experience Barossa gastronomy, you must visit the local cheesemakers, bakeries, smallgoods butchers and other artisan food producers including, of course, the famous Maggie Beer’s Farm. After so much eating you might wish to rent a bicycle for a self-guided cycle tour, and when you’ve visited your fill of boutique cellar doors, swing past Barossa Valley Brewing for a cleansing local ale. 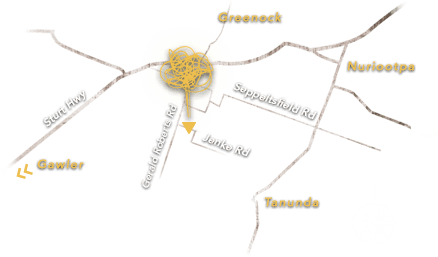 Our friends and neighbours along Seppeltsfield Road are a group of local food, wine, and accommodation businesses passionate about living and working along the road. With a wide range of available experiences, the collective offerings of the group are sure to delight. It’s true: once you arrive in the Barossa, you won’t want to leave! With plenty to occupy you for the whole weekend, the Barossa offers a superb variety of unique, boutique accommodation perfect for couple, groups and families. Hentley Farm uses and recommends Caprice Cars and KnH Passenger Services who can pick up and drop off from anywhere in Adelaide. Caprice Cars also offer local transfers within the Barossa Valley. Barossa Taxis service the Barossa Valley and operate 24 hours, 7 days a week. They can be contaced on 0411 150 850.